Viewed from Burpham, a small village three miles away, Arundel Castle looms magnificently above the flat, watery plain, visible on either side of the meandering Arun river below. Built by Roger de Montgomery in the 11th Century, the vast edifice can at times appear brooding and haunting, even oppressive, in both scale and demeanour. But in high summer when the shimmering light picks out in sharp focus, the myriad turrets and high battlements, its sheer vastness never fails to impress, while the castle itself might well have stepped from the pages of a romantic fairytale. In 1940 when my parents moved from London to Burpham, renting a small cottage from the Duke of Norfolk one of whose many properties this included, they were forever aware of the castle's disproportinate size dominating the skyline to the west. A permanent reminder of the power that once emanated from its dark interior, the castle was, and still is, a mighty landmark, one which my parents recognised as playing a large part in their daily lives. Arundel castle has often been refered to as the principal contender for my father's inspiration for Gormenghast, and although this is undoubtedly one theory, the castle should be seen more as just one of many candidates, for the setting of the novel. Given that we are often inspired by what we have seen and experienced as children, I'm more inclined to think that the castle formed but one of many visual memories retained from a colourful and exotic upbringing. It does not however take much of a leap of imagination to observe Steerpike as he climbs the walls of the castle, now not Gormenghast, but Arundel, while Fuschia waits, unaware of the imminent arrival of the dangerous interloper as he makes his way to her attic, through the ivy. China though, where my father lived for the first eleven years of his life, left an indelible mark, especially having accompanied his own father on many journeys around the country. The Forbidden City, in what was then Peking, for instance, with its pagodas and temples, bactrian camel trains, mandarins, mules, sedan chairs, bound feet and pigtails, but above all perhaps, the enormous animals carved in stone, which lined either side of the roadway that led out of the city, and known as The Great Spirit Way. All this however was to remain in his subconscious, only later to be incorporated in his writing. The Yangtse river, 3000 miles long and a mile wide in parts, had a profound impact, with its dark, eerie gorges, through which he and his father would sail their river boat when visiting rural areas in my grandfather's capacity as medical director for Hunan province also left childhood memories, never to be forgotten. When my father first began writing Titus Groan in the early 1940's, mostly in army barracks where he was stationed at the time, the years in China would have been very much on his mind. The reality however, was that his experience of contemporary wartime Britain formed the actual background to his first novel, not the exotic orient where he had grown up. Many of the characters, their strange names, odd habits, and idiosyncratic behaviour were the result of ideas gathered during the daily walks my parents took on the Downs above the village. Ideas, thoughts, even titles for the book were discussed together; my mother always saying that the only three things she would take if their cottage caught fire were the baby, ie myself, nappies, and the latest additions to the manuscript, which my father had left behind with her for safe keeping. The tantalizing conundrum she hoped to resolve, while escaping this hypothetical burning, was something of which I remained unaware. In celebrating the longevity of the novel and its many incarnations, the origins of which began in a tiny Sussex village in wartime Britain, it is vital to remember the important part which China played in the author's life, while Arundel, although significant, played no more than a walk-on part in the world of Gormenghast. 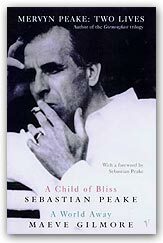 Read Sebastian Peake's biography of his father "A Child of Bliss"